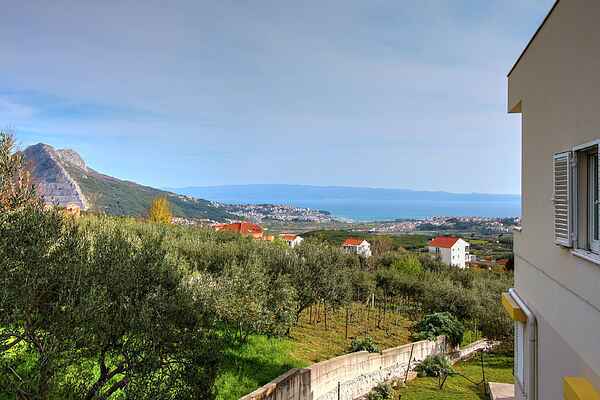 Located nearby Split town, in a quiet small village of Kučine on southern slops of the mountain Mosor, this spacious apartment offers peaceful stay in one of Croatian best know tourist region. The apartment is situated on a second floor of a small private edifice with little garden. It has private parking place, barbecue on large terrace overlooking Split and islands. It consists of one double bed room, one bunk bed bedroom, two bathrooms, kitchen, dining and living room and terrace and can comfortably fit 6 persons, if using sofa bed in living room. Sofa bed can be used as 2 single beds or one double bed. The small grocery shop is next to the house and small local restaurant as well; while the shopping mall is just minutes away by car. Apartment’s location is very convenient to explore the region. Within 10 or max 30 min by car, you can reach many nice beaches, as well as the region’s most famous sights such as Split, Trogir, Klis, Salona, Omiš, Radmanove Mlinice, Cetina river canyon; so you can combine both culture and leisure. By 7 and more days booking, private Split Old Town Guided Tour provided by licensed guide, is the owner’s welcome gift to you.